Diane Davis (Communication ‘00) and Chris Stack (right) perform a scene from the Goodman Theatre’s upcoming production of “The Sign in Sidney Brustein’s Window,” featuring costumes designed by Alison Siple (Communication ‘98). Siple has worked on more than 70 productions in Chicago and across the U.S.
Alison Siple (Communication ‘98) graduated from Northwestern without ever taking a costume design class. Eighteen years later and with more than 70 productions across the U.S. in which she’s billed as the chief costume designer, Siple cannot recall how she jumped on that wagon in the first place. 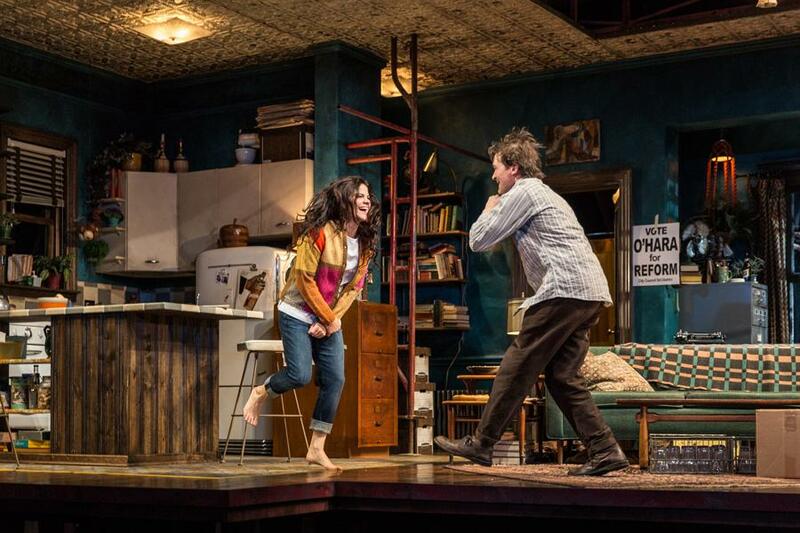 Siple’s upcoming project, “The Sign in Sidney Brustein’s Window,” is scheduled to open Monday at the Goodman Theatre in Chicago. Written by “A Raisin in the Sun” author Lorraine Hansberry, the play follows a man’s involvement in a political campaign and his disillusion with the world in which he lives. With the play set in 1964 New York, Siple said it was a fun challenge to research the time period and immerse herself in Greenwich Village’s then-culture. The production’s dramaturg, Jonathan Green, whose job focuses on contextual research of the play and playwright, said he collaborated with Siple and director Anne Kauffman to recreate the decade’s vibe as closely as possible, but to still incorporate modern nuances. Although the two collaborated on the end result, Green and Siple did preliminary research separately. Siple said she conducted mostly visual research, looking up photographs of what the cultural trends of the time were, what the people looked like and even what emotions they exerted in the images. Diane Davis (Communication ‘00) joined the production of “The Sign in Sidney Brustein’s Window” as the main character’s wife, a struggling actress named Iris. Her costume transitions from a laidback jeans-and-barefoot look to a more posed dress-and-heels outfit, reflecting the character’s change in the play. Davis’ collaboration with Siple was “fantastic,” she said, as they were always on the same page in terms of styling Iris and making her costume complement the scene’s mood. Siple said involvement in the NU student theater scene helped define her design aesthetic. As a board member of Wave Productions, she said building sets and overseeing all design ideas allowed her to brainstorm projects of her own and push past creative limitations. The transition from the student theater environment to the professional world requires a lot of effort, she said, because working for venues like the Goodman Theatre is something only few people achieve early in their post-college careers.